Welcome to Golf Animals – the game! It’s new, it’s fast and it’s fun! Golf Animals is a game of skill, fun and hopefully fortune that you play while on the golf course during your round of golf. It’s a game on which you bet money, a few beers, or the farm!!... it’s up to you. But it’s also a game of tactics and cunning, pitting yourself against your opponents, and hopefully coming out on top! The game of Golf Animals consists of a set of cards with animal caricatures that represent various events encountered on the golf course. Some of the events are positive such as a net birdie or zero putts on a hole. Others are negative events such as hitting a tree, losing your ball, 3 putting a green or getting caught in a sand trap. A value is placed on the cards prior to pay - say $1.00 per card. The round commences and as players encounter the events represented by the card in the pack they are given the applicable card. Cards are passed on as other players encounter the same event. A card may change hands more than once on a single hole. At the completion of the round each player with negative cards pays the other players in the group the agreed value for each card held. Players fortunate enough to hold the positive cards get paid the agreed value by each of the other players in the group. 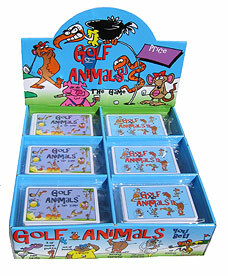 Golf Animals packs comprise 8 cards per pack. Cards are the same size and approximate weight as credit cards and are made of plastic. Cards are very long lasting and are weatherproof so will not disintegrate with moisture. Printing is of the highest quality and will not scratch off the cards, so they can take a good deal of abuse on the golf course. Each pack is shipped in a protective pocket to keep the cards clean and together in their sets. Images are original copyright artwork and are bright and vibrant. Buy this pack now for only US $14.95 delivered. Golf Animals brings a new perspective to your game and may alter your playing strategy. It certainly should make you think about your shots and your options, and introduces some insights into tactical play. If you are likely to 3 putt and your opponent has a long or difficult putt ahead, you may be better served by putting out rather than marking your ball. In doing so you may have a good prospect of passing the Snake on to your opponent rather than being the last to putt out and land the card yourself. If the approach to a green is heavily bunkered you may prefer to take your shot early so that your opponents are more likely to follow you into the bunker. If you are last to go into the bunker then you will end up with a card. the Cat or the Camel. Be careful though!! . soon you may land a card for deliberately playing out of turn! !